For the first time in six years, a new word has appeared in an annual assessment of the Archdiocese of Philadelphia’s finances: surplus. The archdiocese released audited financial statements for the Office of Financial Services (OFS), representing the central administration, for the 2018 fiscal year ending June 30, and they show a $1.3 million operating surplus. 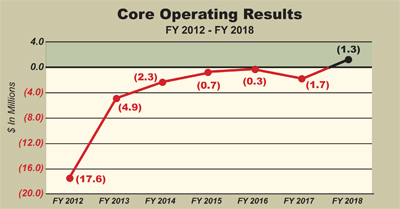 Relative to unrestricted revenues of more than $103 million, the surplus figure is slightly better than break-even, yet it is a significant indicator of restored health that officials expect to continue through the 2019 fiscal year. And it represents the completion of a dramatic rebound to this point in the financial health of the archdiocese from a $17.6 million core operating deficit in fiscal 2012 to the present. In fiscal 2018, the reported difference between revenues and expenses for the year was a change in net assets (a reported surplus) of more than $20 million. After adjusting for several non-recurring and non-operating items, the core operating result was $1.3 million in the black, according to a supplemental analysis prepared by OFS. As in previous years, the audited financial statements were audited by the firm Grant Thornton. While unrestricted revenue for the 2018 fiscal year was $103 million, down from the previous year’s $107 million, the change in expenses was more dramatic. For 2018, unrestricted expenses totaled $83 million, compared to 2017’s $106 million. Since the archdiocese is self-insured for its medical plans and portions of its casualty insurance program, premiums for its insurance comprise the most significant revenue item in 2018, at $65.8 million, against insurance expenses of $48.1 million. In 2017, insurance expenses were almost $71 million versus revenue of $67 million. The second leading revenue item for 2018, and the key item for determining the core operating result, was parish assessments at $21.9 million. According to the financial statements, parishes were assessed at a higher rate in 2018, 12.25 percent, up from the previous assessment rate of 10.5 percent. Assessments for 2018 were based on all parish operating revenue in fiscal 2016 including Sunday collections, other parish collections, church events, donations, interest, dividends, rental income and where applicable, net income from parish cemeteries. Parish assessments for fiscal 2017, calculated at the lower rate, were based on parish operating income for the 2015 fiscal year. Focusing on the balance sheet, improvement was shown in the financial position of the archdiocesan Deposit and Loan Program. The audited financial statements showed loans receivable of $24.9 million in fiscal 2018, down significantly from $36.9 million in 2017. In part this resulted from the sale of loans with principal value of approximately $8 million to the priests’ retirement plans. The loans historically were made by the Deposit and Loan Program, a trust into which parishes make deposits through which the archdiocese pays interest (1.25 percent) and offers loans for parish programs or capital expenditures at a 4.5 percent rate. The program in 2012 was grossly underfunded, with deposits on record exceeding assets, by $82 million. By fiscal 2018, the gap had narrowed to underfunding of $26.2 million thanks primarily to the sale of real estate properties and other archdiocesan payments. A moratorium on new loans and new deposits has been in place since February 2017. According to the OFS analysis, the archdiocese expects to fully fund the Deposit and Loan Program after the sale of certain archdiocesan properties pledged for the shortfall, including the former Don Guanella Homes tract on Sproul Road in Springfield, Delaware County. The turnaround of that program and three other “balance sheet obligations” may be the most dramatic improvement revealed by the 2018 audited financial statements. The Deposit and Loan Program, Risk Insurance Trust, Priests’ retirement plans and archdiocesan Lay Employees Retirement Plan (LERP) collectively were underfunded by a whopping $354.4 million at June 30, 2012. But by June 30, 2018, the end of the most currently completed fiscal year, the underfunded balance had been reduced to $82.5 million — a swing to the positive side of almost $272 million in six years. The Risk Insurance Trust and Priests’ Retirement plans are now overfunded by $14.3 million and $10.3 million, respectively. The LERP, frozen as an active plan in 2014, began making lump-sum distributions to eligible archdiocesan retirees who requested them in 2017. Since the archdiocese made unplanned contributions of $37.5 million after freezing the plan and increased its payroll funding rate for the plan to 5.9 percent in 2016 from the previous 4 percent, officials expect the LERP to be fully funded within 10 years, according to recent actuarial analyses. Not only is Archbishop Chaput a wonderful Theologian who bravely confronts Modernism, but is a man who has gotten the Archdiocese out of debt caused by the previous two administrations. People have been upset about his selling off some of the properties that Historically belonged to the diocese, but he knew that painful steps had to be taken to return Philadelphia to a solid fiscal ground. Nostalgia for the past was not going to save the Catholic Church in Philadelphia but good hard and difficult decisions from Our Good Shepherd. In the black but at what cost???? Closed schools, closed parishes, the rental of the cemeteries and the nursing homes sold off. The archdiocese is not a business but now it is!